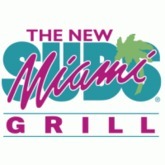 Miami Subs Grill is one of the leading chains of restaurants. The chain consists of more than 70 restaurants located in different region so far across North Carolina, South Carolina and Florida. This privately held restaurant offers service since 1988. The company offers wide variety of menus that include submarine sandwiches, gyros, wings, pizza and cheese steaks along with items from Nathan's Famous and Arthur's Treacher's hot dogs. More than 600 personnel are employed by the company. Recently, Miami Subs declared an agreement to open new branches in Hawaii and in the Middle East GCC countries including Kuwait, Oman, Saudi Arabia, Bahrain, United Arab Emirates and Qatar. There are currently 0 consumer reviews about Miami Subs available. Share your review. Please take a note that you are about to post a public review about Miami Subs corporate office on CorporateOffice.com. This review will be public, so please do not post any of your personal information on this website. If you would like to contact the corporate offices of Miami Subs, please use their contact information such as their phone number, website, and address listed above to contact them. However, sometimes staff from Miami Subs headquarters do read the reviews on this website.